These Celestron Granite binoculars have an open-hinge design which is becoming more and more popular and with good reason. Not only does this design look great, but has some real practical benefits: It helps to keep the weight down and is very comfortable and more secure to hold, in both or even one hand. I don't use one hand when glassing as this is just too unsteady, but often carry the binoculars in one hand especially when walking through thick bush, using the other to clear a path. I do this because your binoculars can often get caught up in the branches of bushes if you carry them around your neck with the neck strap. Over difficult and hilly terrain it is also sometimes very annoying to have a binocular dangling from your neck where they can easily smack against a rock as you climb over it. Simply holding them in your hand overcomes these problems and the open-hinge design means that you can hold onto the binocular much more firmly by wrapping your hand completely around one barrel. These Celestron 8x42 Granite binoculars also come with some really well placed thumb and fore-finger indents that makes them even more comfortable to hold and encourages you to hold them in the right position when glassing. In this position, I though that these Celestron's were very well balanced which helps you to keep them steadier and is more comfortable when using binoculars over long periods. I must add that weight can sometimes be a little misleading as some of the lightest binoculars on the market are also amongst the cheapest (and worst) - this is because some very light binoculars are only this weight because they use sub-standard materials in their construction that may be lighter, but are definitely not as durable. I can happily confirm that this is not the case with these 8x42 Granite's as they have been made from magnesium which is not only much lighter than aluminum that is often used, but is exceptionally strong. With their eye-cups fully retracted, they have a length of 14.7cm (5.8in). 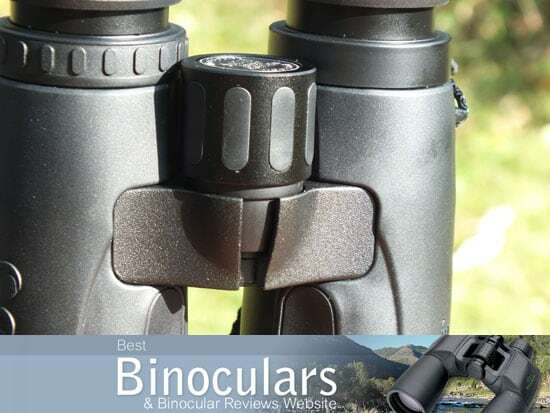 Folded, their width is 10.3cm (4.0in) - opened it is 12.3cm (4.8in) and their height is 5.4cm (2.1in), which for a full-sized binocular is very good and they are one of them most compact 8x42 binocular that I have reviewed. In my average sized hands they felt very comfortable with the finger and thumb indents being well placed and holding them up to my eyes, the focussing wheel was easy to get to as well as easy to adjust without having to change grip. The magnesium body on these Granite's feels really solid and robust and does give you that "feeling of quality". Over most of this housing they have been covered with a really hard black rubber armoring, apart from the two bridges (that connect the two barrels together) which have been left exposed, but also colored black. This creates a nice effect and will help to keep the optics weight to a minimum. Because it is so hard, the armouring is not as tactile as some binoculars out there, but will still improve the grip compared to a un-rubberized binocular. This armour will protect your optics from day to day knocks and bumps and has another benefit of making them less reflective - an important feature if you want to remain hidden when observing timid birds and other wildlife. Celestron are also keen to point out that no lead or arsenic has been used in their construction making them much more friendly to the environment. These Celestron binoculars are waterproof which in their words means they are "capable of withstanding limited exposure to the weather or elements without risk of damage". So I wouldn't go swimming with them, but they should handle most reasonable wet weather. Waterproof binoculars not only prevent moisture from getting into them, but will also stop also any other small debris and dust from getting into the system which could lead to the view through them being spoilt. They have also been "nitrogen purged" which means all the internal air has been replace with nitrogen gas which will protect them against internal fogging. Fogging can occur when you get rapid temperature changes or in places that have a high humidity level. A secondary benefit of this is it protects the inner workings from corrosion because there is no internal moisture. The fairly standard twist-up eyecups on these Granite 8x42's are made from metal and have a thin soft rubber coating on top of them that makes them feel fairly comfortable even when pushed quite firmly against your face. The twist-up mechanism on the eyecups is really smooth and works well. They do have one fixed intermediate stop which helps those who do wear glasses to get the right amount of eye relief for them, but must be said is not as flexible as ones that have more intermediate stops or that can be stopped at any point. Non-eyeglass wearers will just use the eyecups in the fully extended position. The 17mm (0.67 in) of eye-relief should be more than enough for most eyeglass wearers to be able use the binoculars without having to remove their glasses and still get the full field of view without any vignetting. It also means that they easily make it onto my list of long eye relief binoculars. The large focussing wheel on the pair that I reviewed turned really smoothly and was easily reachable. Unlike cheaper binoculars which are often made from plastic, this one is made of metal and has rubberized strips on it to help with grip. The wheel two full turns go from infinity to it's minimum focusing distance of 6.5 ft (1.98 m). What this means is that focusing from near to far (or vise versa) is not as quick as a binocular that takes less amount of turning (some take as little as half a turn), but it does have the advantage of making fine tuning your focus to get it exactly right much easier. The diopter adjustment ring is located on the right barrel, between the eyecup and the barrel, once again it looks to be made from metal that has a rubber coating on it with raised sections to help with grip. This diopter adjustment ring is used to correctly set up and focus the binoculars to your particular eyesight. This process really only needs to be done once when you first use the binoculars, or if you share them with others. On my pair, it was just about tight enough to prevent it from easily being moved accidentally. There is a marking the diopter ring and barrel so you can easily see where the neutral point is, but if the setting for your eyesight is not neutral, you may want to make a small mark on the barrel to help you quickly return to your correct setting should it have moved accidentally. One of the most impressive features on these Granite Binoculars is their use of extra-low dispersion glass (ED) in the optical design. ED glass can improve the sharpness of the image and helps to eliminate chromatic aberration (color fringing). This is achieved by giving the designers of the multi-element objective lens a wider range of options to better direct and concentrate the wavelength of light. Generally speaking, the better the aberrations are controlled the cleaner and brighter the image will appear. Because of the costs involved and precision needed to make them, ED glass is only usually found on high end cameras, telescopes, microscopes and binoculars. To start with, instead of the inferior BK-7 prisms found on cheaper optics, these 8x42 roof prism binoculars use BaK-4 glass on the prisms, this superior optical glass helps to produce clearer images. On top of this Celestron have also added phase correction coatings on the prism glass. They are used because when light waves are reflected at the opposite faces of a roof prism, "phase shift" occurs which means that you get a small amount of deterioration in sharpness. These coatings counter this by keeping the light in the correct color phases and therefore produce images that have better contrast, a higher resolution and improved color reproduction. These coatings are only really found on higher end roof prism binoculars. As well as this, Celestron say that they use "High Reflectivity Coatings" on the prisms, but don't state exactly what they are or what their reflectivity is. My hope is that they are dielectric coatings that cause the prism surfaces to act as a dielectric mirror and has the effect of increasing the reflectivity to more than 99% across the visible light spectrum meaning that you get better light transmission (brighter images) and excellent color fidelity. Cheaper "High Reflectivity Coatings" include aluminum mirror coatings that have a reflectivity of between 87% to 93%, or silver mirror coatings that increases reflectivity to about 95% to 98%. 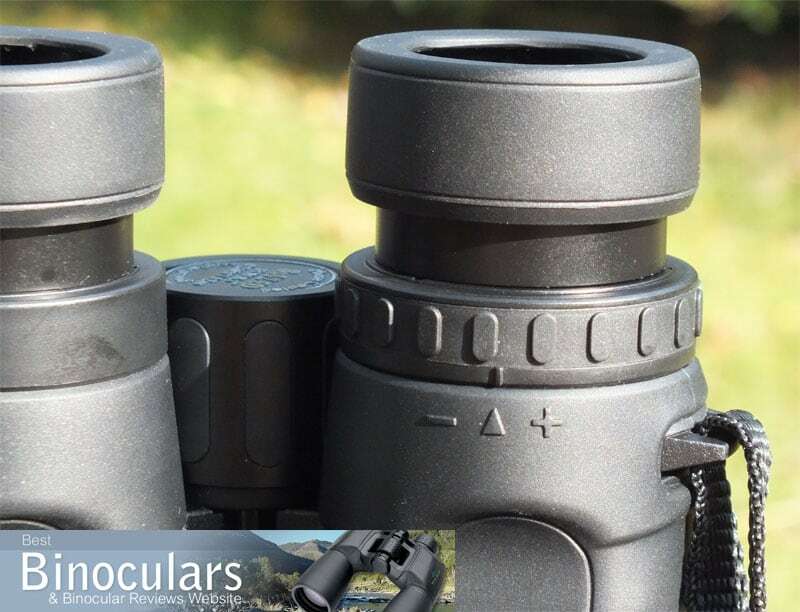 Fully multi-coated lenses are used on these Celestron Granite binoculars, which means all air-to-glass surfaces have received multiple layers of anti-reflective coatings which increases light transmission to produce a brighter image and therefore better low light performance. Anti-reflective coatings can make a huge difference on the brightness of the image produced. I have often seen binoculars with smaller objective lenses, but high quality anti-reflection coatings easily outperforming binoculars with much larger objective lenses, but with fewer or no coatings. Beware of these lower quality optics that will often only add multiple anti-reflection coatings to the outer surfaces of the lenses (Multi-Coated) and cheaper still are optics that only have a single layers of anti-reflection coating added to the outer lenses (Coated). The very cheapest optics have no anti-reflective coatings at all and I highly recommend staying well clear of these. At 426 feet@1000 yards (142m @ 1000m) or 8.1°, the field of view through the Celestron 8x42 Granite binoculars is excellent and they easily make it onto my list of wide angle binoculars. To put this in context, they easily beat some of the very best out there, for example the Swarovski 8.5x42 EL, which is at the very high end of the market and many peoples ideal birding binocular has a field of view of 399ft at 1,000 yards. I consider a minimum focusing distance of under 6ft to be excellent. The closest distance you can focus on an object with these 8x42 Celestron binoculars is 6.5 feet (1.98m) which is still very good. So whilst these may not be the ideal choice of binocular if you plan to spend most of your time observing objects at close range (things like butterflies for example), they will perfectly hold their own for occasional close range observation. Their maximum eye-relief of 17 mm (0.67 in) is also very good and should be more than enough for most people who wear glasses. It also means that they make it onto my list of long eye relief binoculars. Testing was carried out on an overcast morning and in terms of image brightness, I could notice as small improvement between these and my benchmark binoculars and so because of this I rate them fairly highly in this department. Good light gathering ability is important because quite often you will find yourself in situations where the lighting is sub-optimal, especially in thickly wooded or forested areas, early in the morning just before or at sunrise or late afternoon when most birds and other animals are at their most active. All 8x42 binoculars, including these Granite's have an Exit Pupil of 5.25 and a Twilight Factor of 18.3, both of which indicate that they will perform well in most low light conditions. But no matter how much light your binoculars gather, it is no good if that light is not passed onto your eyes (transmittance) and so it is important to remember that not all 8x42 binoculars are created equal and the image brightness and the performance of a pair of optics in poor light also depends hugely on the quality of the glass and optical coatings and not just the exit pupil and twilight factor formula. Good coatings on the lenses and the prisms can in some cases double the amount of light that gets through the binocular, when compared to those that have none or poor quality coatings. But as I have already mentioned these Celestron Granite's use good quality coatings and glass that contribute to them transmitting more light to your eyes and therefore produce a brighter image than inferior binoculars of the same configuration. To check for any color fringing (chromatic aberration), I focus on light coloured and white objects sitting in front of a dark backgrounds as this is where it is easiest to notice if there is any on the objects edges. To my eyes there was almost no visible colour fringing on these Granite's and this is where the ED glass on these Granite's really makes a difference as it is a fairly big improvement when compared to my non-ED glass control's. The amount softening of the image on the periphery of the view is for me the weakest part of the view through through these optics. Whilst it is not bad, if you are looking for it, you can notice it and is a little more than what you find on many other top end binoculars. The amount of contrast is good and the colors that are produced look and feel very natural, unlike the artificial tints that you sometimes find on cheaper binoculars. Once you have correctly focussed on an object the image is also pin sharp and I thought that the depth of field was also pretty good. Overall and to sum up, I would rate the view through these Celestron's as very good and would have been excellent apart from the small amount of image softening on the edges. Below is a table comparing this Celestron Granite with a selection of other full size roof prism binoculars with magnifications of around 8x including the very top of the range Swarovski 8.5x42 EL's, the mid to high value Minox 8x43 HG Binoculars, Kowa 8x42 BD, Eagle Optics Ranger ED 8x42 and the Vortex Viper HD 8x42. What the table above does highlight is just how impressive their field of view is and that they more than hold their own in most other departments. 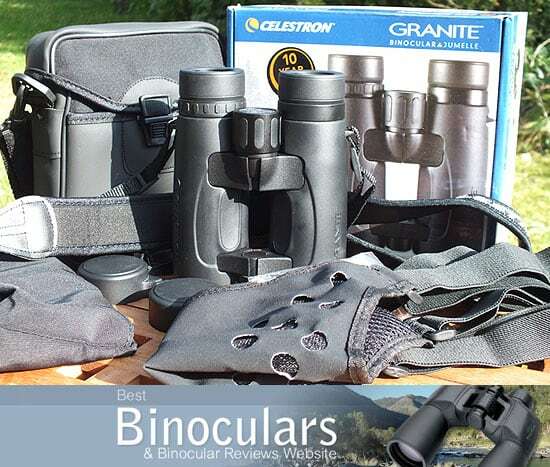 The next strap is for the Celestron Granite binoculars is of pretty good quality and looks to be well made. I have seen straps with more padding, but even so these is enough to make them comfortable even when carrying our bins for long periods. The padded section that hangs around your neck is also slightly curved to ensure that it fits better around your neck. I really like the soft carry case that is pretty well padded and comes with a separate pocket on the inside that can be used to store a few small personal items and would be a good place to keep your lens cleaning cloth, some money or your car keys for example. The binoculars fit nicely within the bag and are snug enough to be well protected, but not too snug as to make taking them in and out difficult. The carry case strap works well, but is possibly not quite as well padded as some of the better ones I have used. One thing that is missing from the bag is a belt loop on the back that many other bino bags have, this would allow you to attach the bag to your belt rather than carrying it with the strap. The eye-piece covers are made from a very flexible rubber/plastic and they fit very well over the eye-pieces and should not accidentally fall off. I like the fact that they have a flexible bridge between the two cups that allow for the different distances between the two eyepieces depending on your inter-pupillary adjustment. This is something that is often overlooked by manufacturers meaning that the eyepiece covers wont fit, unless you store your binoculars fully open, which can be a real pain as you have to adjust them every time you use and replace your binoculars. 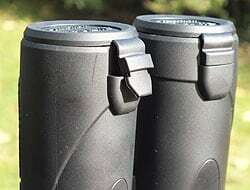 The hard rubber/plastic objective lens caps fit well and should not accidentally come out, they are attached to the barrels of the binocular, but can be removed by un-clipping them from a hole under the barrel. This is a feature that I really like as I find that I often misplace ones that are not connected. If like some people, you don't like to have the covers attached it is not a problem as they can also easily be removed and put away in your bag. It is always nice when you get something that you don't expect and this is the case with these binoculars, as Celestron have rather generously also included a very nice binocular harness with them. Also often called binocular suspenders, they take the strain off of your neck and distribute the weight of the binoculars to your shoulders and torso. Another advantage of the harness over your neck strap is that it keeps your optics closer to your body and allows you far more freedom when traversing over difficult terrain. I tried the harness on a few long walks and felt it was very comfortable, very light and the support area on the back is well ventilated to help prevent you from sweating at that contact point on hot days. The harness also comes with it's own small carry bag for easy storage. For a demonstartion of me using the harness, take a look at the video review below. Also included is a good quality lens cleaning cloth as well as a basic instruction booklet that includes information on adjusting the eyecups, the inter-pupillary adjustment, how to properly focus your binoculars, lens care and cleaning and what to do if there is a problem of if the optics need to be repaired. 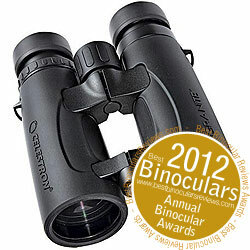 These Celestron binoculars also come with a 10 year warrantee which is also available in the UK. There is a small cover or cap on the front hinge that can screw off to allow you to then screw on a binocular tripod adapter (not included) that uses the standard ¼-inch threading, which you can then attach to your tripod. Strong Points: Their very wide field of view is a real highlight as is the quality of the optical components used and their coatings that on the whole contribute to producing a excellent quality and bright image. I also really like the open bridge design and the overall look of the binocular. Weak points? Compared to how good the quality of the view was in terms of image brightness, contrast, color reproduction, sharpness and the fact that there was almost no color fringing, I was a little disappointed with the small amount of softening of the image right on the edge of the view. Don't get me wrong, it was far from being bad and when focussing on an object you tend to look in the center of the view, so it is only really noticeable when you are actually looking for it, but it is there. Ideal Uses: Like most 8x42 binoculars and especially considering their impressively wide field of view, these make perfect birding binoculars. This is because they strike a good balance between their field of view and magnification with lenses that are large enough to make them nice and bright even at dawn or dusk, yet not so large that they are too big and heavy to carry about with you. 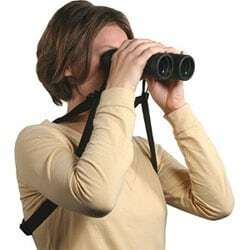 I would also say that these would be good as hunting binoculars and great for general wildlife observation optics. Because of their pretty good close focus, they would be ok for anyone looking for a full size binocular that can also be used to view things like flowers, butterflies, dragonflies and other insects and objects really close up. But if this is your main intended use for them, you are far better off getting a binocular with a very close minimum focusing distance - check out my section on Butterfly Binoculars. 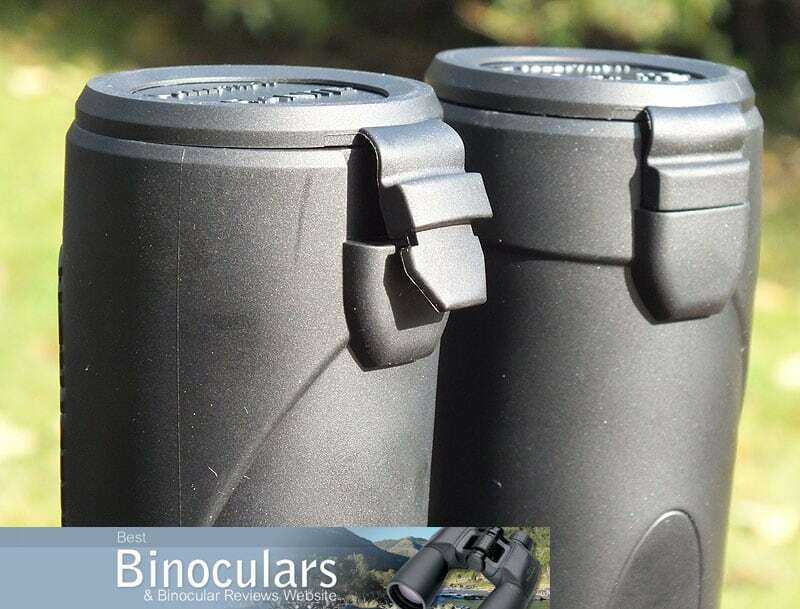 Whilst you could take these 8x42 binoculars on a camping trip, on safari or to an outdoor sporting event, if it is going to be your main use for them, I would suggest getting some compact or mid-sized pair of binoculars that will be easier to put in your bag or luggage. Something like a mid sized 8x32 or even a compact binocular may be more ideal for these uses. 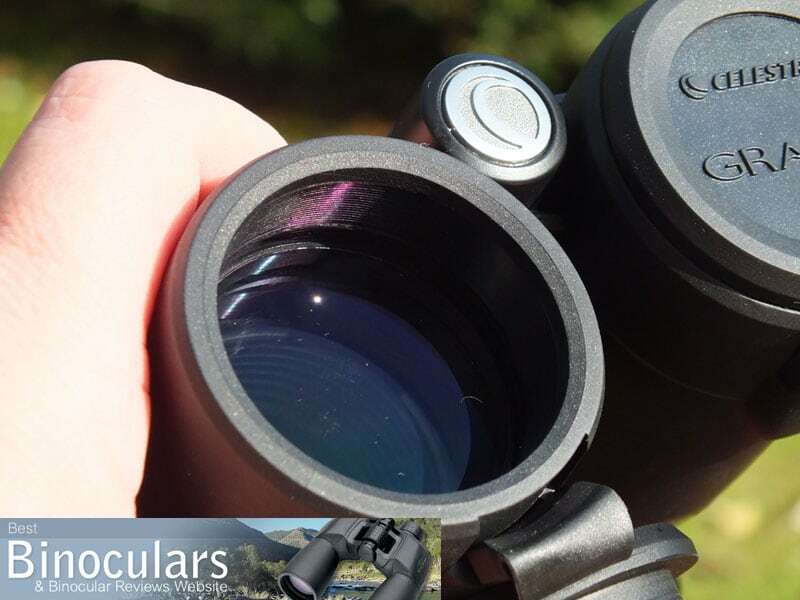 Overall I would say that the 8x42 Celestron Granite is an excellent binocular and if you consider what you pay for them, compared to other high end optics that also feature ED glass, it makes them even more impressive. It is for these reasons that in my opinion they should easily make it onto the shortlist of anyone looking to get a top quality pair of optics at a great price.